After last year’s overhaul of the long running Assassin’s Creed franchise, Ubisoft is returning to its annual iterative update with this year’s Assassin’s Creed Odyssey. 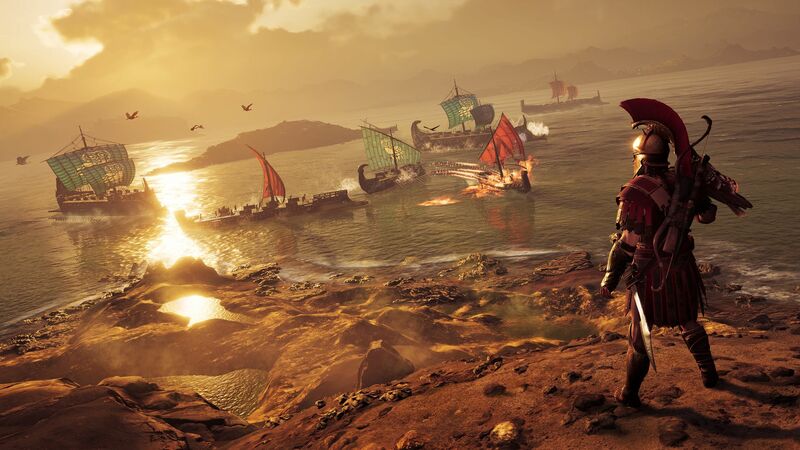 Building on Assassin’s Creed Origin’s success, Odyssey takes players to the Peloponnesian War where the Delian and Peloponnesian Leagues are locked in battle. Gamers will choose between two characters as they find out who is wielding the true power in Ancient Greece. It’s 431 BCE and the Peloponnesian League led by the Spartans are locked in conflict with the Delian League led by Athens. While the two sides battle it out, mercenaries and arms dealers profit among the bloodshed and chaos. Players take on the role of Alexios or Kassandra, a mercenary who was raised on the island of Kephallonia. Their desire to leave the small island in search for adventure sets them on a collision path with a mysterious organization that is pulling the strings of power for an unknown purpose. Assassin’s Creed Odyssey is the usual mix of conspiracy and shadowy organizations that we’ve come to expect from the franchise over the years. While the general themes remain the same, the writers have done a fantastic job this year mixing modern and ancient myth in a captivating story. For those new to the franchise, the story holds its own. I like how small details change based on the player’s decisions and actions within the game. The side quests are surprisingly meaty, with a solid mix of one-off comedic relief quests and interesting quest chains. Based on the success of last year, Assassin’s Creed is now firmly an action RPG franchise. 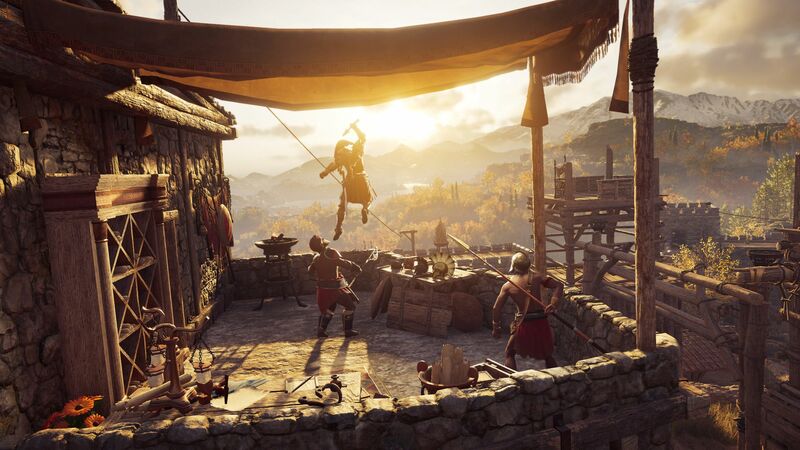 The core gameplay mechanics from last year’s Assassin’s Creed Origins makes its return in a slightly more polished form in Assassin’s Creed Odyssey. Once again, players have access to three skill trees for melee combat, archery, and assassination. The game is designed to give players a good deal of flexibility to approach situations with their preferred approach, whether it’s a one trick character completely invested in archery or a generalist using a mix of all three trees. Combat feels tight and skill based. There are a variety of weapon types that will compliment different builds well. The action is fast paced and rewards skilled players who can land perfect dodges with a period where enemies will be slowed down. Enemies hit hard enough that characters spamming attacks will generally be punished. Stealth has always been a big part of the Assassin’s Creed franchise, though the new gameplay brought in with Assassin’s Creed Origins has put direct combat on more of an even footing. Areas are generally well designed for stealth players to slowly pick their way through fortresses. Bonus experience is awarded for chained assassinations and other stealth based feats, ensuring stealthy players won’t fall behind on the experience gain for taking their time instead of charging in headfirst. The game’s mercenary system combines a variety of mechanics from games like Middle-earth and Grand Theft Auto series. Players start off at the bottom of the mercenary ladder. Hostile actions against people in the two main factions will draw the attention of other mercenaries looking to cash in on the bounty. Players must either lay low, pay off their bounty, or kill whoever posted the bounty. Otherwise, mini-boss level characters with their own combat style, strengths, and weaknesses will begin swarming the area looking for a pay day. While the entire system isn’t revolutionary by any means, it adds a fun challenge to the game and a bit more consequence to the player’s actions. Mercenaries can pop up at the worst possible moment or will swarm a fort under siege in response to the player’s assault. The level design still struggles a bit in Assassin’s Creed Odyssey. The game’s map may be extremely vast, but it’s not particularly deep. Many buildings are reused heavily, and the world feels rather dead. There are plenty of people in the game, but they all seem to be milling about as props than behaving like living beings. There are lots of dead zones in the map that offer little more than a pretty view, a couple of animals, and the odd resource to gather. Until all the fast travel spots are unlocked, players will spend a lot of time just watching their horse as they travel from place to place. There is an improvement over Assassin’s Creed Origins though. 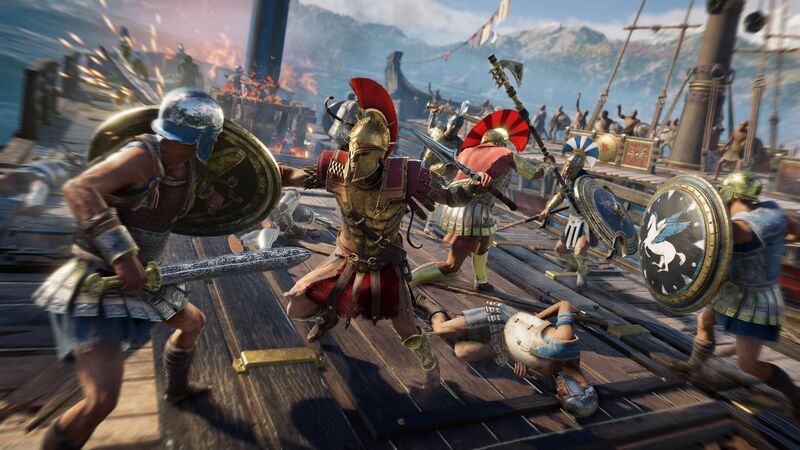 Assassin’s Creed Odyssey introduces naval combat almost immediately. Travelling around by boat tends to be a lot more interesting than land travel due to the constant threat of piracy. The item system is excellent in Assassin’s Creed Odyssey. While the gaming industry and community are still looking for the happy balance with microtransaction, Ubisoft is doing an excellent job of implementing their microtransactions in a reasonable manner. There are plenty of opportunities to nab high quality loot through quests, mercenary hunting, and assassinating cultists. Additionally, existing gear can be upgraded to the player’s current level. I didn’t feel pressured at any time to plunk down real cash for equipment. The real money store seems more focused on offering players cosmetics and time saving shortcuts. Assassin’s Creed Odyssey is gorgeous. The world is colourful and brings famed Ancient Greek locales to life. It appears that the art team has gone to great efforts to replicate Ancient Greek architecture and artwork, which goes a long way in creating the world’s immersive feel. The models and textures look great. The animations are very smooth, save for the horse looking a little unnatural when running on predetermined roads. Assassin’s Creed Odyssey delivers an excellent audio experience as expected from a triple A title. The main voice actors are all very strong. While I can’t judge the quality of the Greek accents, the voice actors generally maintain some level of uniformity throughout the game for the exception of some of the smaller roles. There are a few side quest NPCs who drop their accent as they struggle through their lines. The sound effects are high quality and sound excellent. The soundtrack is an enjoyable accompaniment to the game, always hitting the right tempo to match the gameplay. The sea shanties are probably the best part of the soundtrack and always puts a smile on my face. 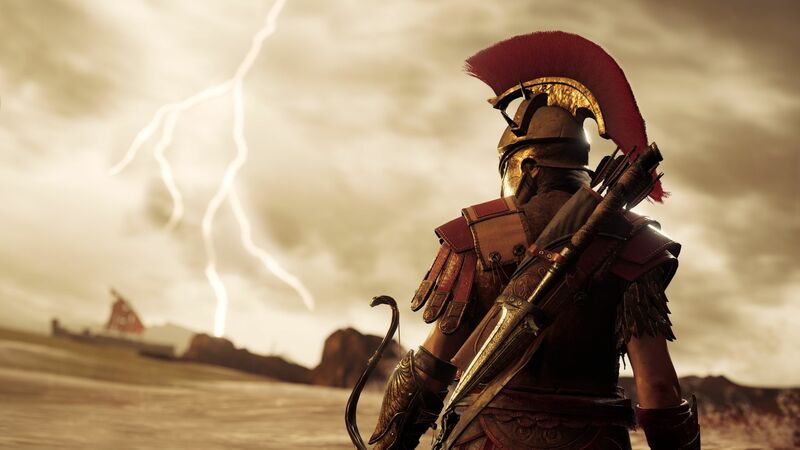 Assassin’s Creed Odyssey isn’t revolutionizing the franchise like its predecessor, but rather polishing and adding to new generation’s mechanics. 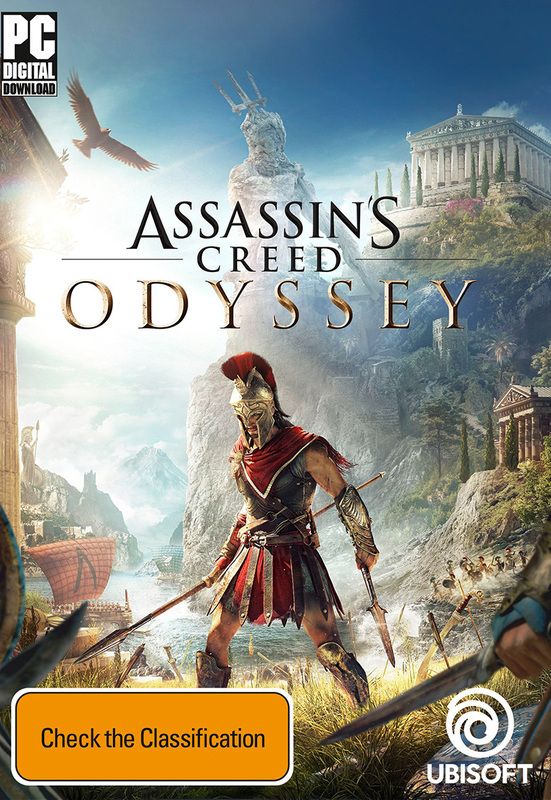 While the game still struggles with large amounts of dead space and a slightly lifeless feeling world, Assassin’s Creed Odyssey offers enjoyable gameplay, tight combat, an entertaining story, and a solid audio/visual presentation. It’s definitely worth a trip to Ancient Greece. An enjoyable game with tight combat, a captivating world, and plenty of content.